AzhwAr meditating upon these aspects, being unable to enjoy such emperumAn as he desired, being greatly anguished, explains his sorrow. Implies that ISvara manifested such desire in AzhwAr towards him, to eliminate the hurdles which are present to enjoy him. In the previous two decads, AzhwAr became anguished thinking bhagavAn is going to be harmed and destroyed by others [subsequently he became pacified]; here, AzhwAr is trying to destroy bhagavAn by his anguished, loud cry. 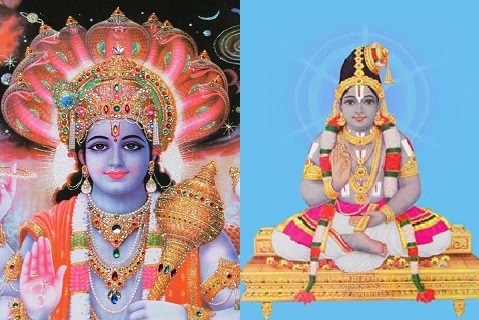 In the previous decad, AzhwAr realised that there are devotees who care for bhagavAn, was relieved of his fear and enjoyed his beauty; that beauty, became well settled in his heart as said in thiruvAimozhi 8.4.8 “thigazha en sindhaiyuL irundhAn“, desired to enjoy him externally and having not acquired such experience, he became greatly anguished thinking “my previous sorrows were nothing; those previous sorrows are only a small portion of the current sorrow”, suffering as if surrounded by forest fire, having senses which are even more anguished than himself, cried out loudly saying “your should appear with your divine limbs to eliminate all my fatigue, you should come with your divine crown, you should come like a cloud, you should come with a beautiful form, and you should come with the great radiance of a rising sun during dawn”. As emperumAn did not appear in front of AzhwAr, he completes the decad with great anguish thinking that it is better to perish than living like this. This entry was posted in thiruvAimozhi, thiruvAimozhi 8th centum on March 17, 2019 by Sarathy Thothathri.